روحی, مهدی, بهروزی لک, غلامرضا. (1397). ظرفیت‌شناسی حاکمیت فقیه در اندیشه سیاسی اهل سنت. اندیشه سیاسی در اسلام, 4(16), 93-118. مهدی روحی; غلامرضا بهروزی لک. "ظرفیت‌شناسی حاکمیت فقیه در اندیشه سیاسی اهل سنت". اندیشه سیاسی در اسلام, 4, 16, 1397, 93-118. روحی, مهدی, بهروزی لک, غلامرضا. (1397). 'ظرفیت‌شناسی حاکمیت فقیه در اندیشه سیاسی اهل سنت', اندیشه سیاسی در اسلام, 4(16), pp. 93-118. روحی, مهدی, بهروزی لک, غلامرضا. ظرفیت‌شناسی حاکمیت فقیه در اندیشه سیاسی اهل سنت. اندیشه سیاسی در اسلام, 1397; 4(16): 93-118. 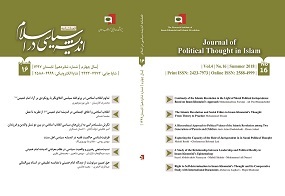 Finding the similarities and qualifications of the ruler and between the political structure of Sunni Islam and velayat-e faqih (rule of jurisprudence) in Shia Islam is the main concern of this research. The principles of the legitimacy of the rule of jurisprudent (velayat-e faqih), according to majority of religious scholars are divine, while the Sunni caliph’s legitimacy is popular-divine. By studying velayat-e faqih one understands that the conditions for practical establishment of the rule of jurisprudent in Shia Islam are almost the same as those for a Sunni Caliph. Sunnis' emphasis on succession to the Prophet, necessity of obeying him, implementation of Sharia and ijtihad (individual inference) as a necessary qualification of the ruler are are the same as the bases for velayet-e faqih in Shia Islam. To present a religious model of a ruler to the Sunni world, it suffices to review the conditions and qualifications mentioned by great Sunni theologians. A closer look at these conditions and qualifications would reveal that a Sunni ruler needs to have ejtihad (power of individual inference from the text), justice, and management capability which all overlap with the conditions of velayat-e faqih. Therefore, the qualifications of velayt-e faqih can be comparative studied with the conditions and qualifications of an ideal ruler in Sunni. ـ خواجه نصیرالدین طوسی، تلخیص نقد المحصل، ص 425. ـ طباطبائی، سید محمد حسین، المیزان فی تفسیر القرآن، (قم: اسماعیلیان، چاپ پنجم، 1371)، ج 14، ص 391. ـ فضل بن حسن؛ طبرسی، مجمع البیان، (بیروت: دارالمعرفه، بی‌تا)، ج 3 – 4، ص 100.